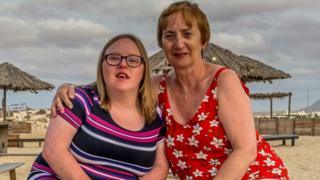 Image caption Margaret Hogan said Shauna had "enriched all our lives"
The mother of a Special Olympics champion has told how her daughter defied her school teachers to compete in international swimming events. Speaking on World Down's Syndrome Day, Margaret Hogan, of Liverpool, urged anyone with the condition not to be deterred from pursuing their dreams. As a child, Shauna's teachers said she could not take part in swimming lessons with the rest of her class because she was a "health and safety risk". But she went on to represent Team GB. Mrs Hogan said when Shauna was told she would not be included with the rest of her class, she threatened the school with a disability tribunal, and gave them a month to change their approach. During that time she enrolled Shauna in private one-to-one lessons. "She was confident in the water and it soon became very apparent she was a good swimmer," Mrs Hogan said. "After a year of lessons the teacher told us she needed to be swimming competitively, so we took her to the Down's UK Championships. "We hadn't a clue how good she was, or how bad she was, but she won every race she was in." Since then, Shauna has represented Team GB in the Special Olympics in Puerto Rico in 2012, winning one silver and two bronze medals. In 2014 she represented the country at the Southern California Special Olympic Games in Los Angeles, winning two silvers and a bronze. Now aged 26, she is promoting the 2021 Special Olympic Summer Games in Liverpool. Mrs Hogan, of Old Swan, said: "Maybe we didn't expect to be parents of someone with Down's Syndrome and it is certainly not without its challenges, but Shauna has enriched all our lives. "I should thank that teacher because if he hadn't said she couldn't swim, we would not have pushed and Shauna would not have swum for her country. "I feel passionately that every person with Down's syndrome is an individual and should be treated as such. "Any child can achieve if they are given the opportunity. Shauna has proved that to the world."